Learn what we do and how we help manufacturers to succeed! If you are planning to produce food or Beverage products, this session is for you! Featuring guest speaker, Mary Gassen of Noe Valley Bakery. If you’re planning to produce apparel or sewn products, this session is for you! Inviting all SFMade members to meet the SFMade staff, get to know each other, and enjoy a beer. This is the one “members only” event of the year! Join SFMade as a volunteer advisor and make an impact in your local community by coaching start-up and mature business owners in short, efficient one-hour sessions. We are looking for advisors who can provide general business advice as well as expertise in specific sectors and subject areas. Commitment is on an as-needed basis, so it can be as little as a few hours per month. Factory tours, demos, pop-ups, sales, parties, oh my! SFMade Week celebrates the city’s manufacturing sector with 60+ events taking place over seven days. Details coming next month. Members, find out how to get involved here. Interested in sponsoring? Email [email protected]. Roy, his father Jude and mother Rohnin were all hired by Mafia Bags just a few weeks after moving to the U.S. from Sri Lanka. The family was connected to Mafia by SFMade’s Hiring Made Better Program and the International Rescue Committee. We’ve seen our fair share of upcycled products, but bags made out of sails? That was a new one. Mafia Bags first came to SFMade through our How to Manufacture Locally for Apparel and Sewn Products workshop. 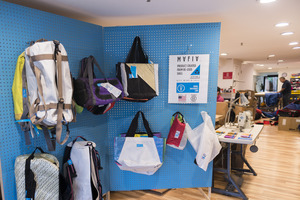 The start-up company uses materials from recycled kite surf, wind surf and boat sails to construct backpacks, accessories and duffel bags. Shortly after they set up their factory, Mafia grew their small family to hire a father and son team, Jude and Roy— and soon after Jude’s wife, Rohnin as well. They were connected through SFMade’s Hiring Made Better program: our workforce and hiring manager helped them to craft the job descriptions, shared the positions with our workforce partners, and made the match with the help of the International Rescue Committee. Originally from Sri Lanka, Jude and Roy had only been in the U.S. for a total of five weeks when they started working with Mafia. To learn more about the team read Mafia’s blog post here. Photos by Josh Schielie, courtesy of Mafia Bags. To look for employment positions with SFMade members, check out the SFMade job board at www.sfmade.org/job-board. For information on how to post open positions on the SFMade job board, contact SFMade’s Hiring Manager Claire Michaels at [email protected]. Product We Love: For Lev, Kombucha was never trendy. Originally from Uzbekistan (where everyone and their grandma was drinking fermented beverages) Lev turned his mombucha-making hobby into a business in 2006. Since then he’s been brewing all kinds of quality flavors on Treasure Island, and his black currant just won a Good Food Award. SFMade Founding PartnersCity of San Francisco, Rickshaw Bagworks, Citi, FHL Bank San Francisco, Anchor Brewers and Distillers, Wells Fargo, Levi Strauss & Co, Ritual Coffee Roasters, Cayson Culinary Designs, Hanson Bridgett, New Resource Bank, Pacific Waterfront Partners, Bank of America, McRoskey Mattress Co, TechShop, BayPoint Benefits, DODOCase, North Point Advisors, and Insperity. Empowering manufacturers. Creating jobs. Transforming our city. SFMade’s mission is to build and support a vibrant manufacturing sector in San Francisco, that sustains companies producing locally-made products, encourages entrepreneurship and innovation, and creates employment opportunities for a diverse local workforce. SFMade is a 501 (c)(3) non-profit corporation.